For use on 1969-1991 Chevy small block V-8 and most 90° V6 engines. Direct replacement for all late model front covers that use a bolt-on timing pointer. Proform's Officially Licensed Chevrolet Timing Chain Covers have been engineered to exceed Chevrolet's high standards for reliable installation and long-lasting durability. Covers are stamped with the distinctive Chevrolet logo and will be sure to complement any engine compartment. 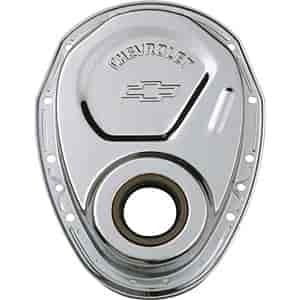 All timing chain covers come supplied with Chevrolet production oil seals installed. Does Proform 141-215 fit your vehicle? 141-215 is rated 5.0 out of 5 by 1. Rated 5 out of 5 by crah from Great fit - doesn't leak! Had installed a chrome cover from a different mfg. It always seeped, then leaked terribly. Then after several attempt to repair, just decided to go ahead and replace it whit the Proform cover. Fit perfectly and, better yet, does not leak! Yes this will fit your motor.